Yoga Rave is here! | Art of Living, Sri Sri Ravi Shankar and My Self! If you have not heard about Yoga Rave yet, you must be in some other planet who just got out of hibernation! Or maybe underground. Yoga rave, is the new way to party! A rave party like no other. It is a substance free party for all ages with yoga and meditation infused in between the hard rock techno sanskrit bhajans! Wow, now that is unusual blend! It is a healthy and balanced fun alternative where you sing and dance to mantras to feel energy, joy and enthusiasm that comes from within rather from external substances. Isn’t that something wonderful to experience? Yoga Rave is a party like none other in the world, a new concept in fun where the body responds only to the stimulation of music, yoga & meditation. The initiative sprang forth from the Art of Living Foundation, the largest volunteer-run NGO in the world. Just like the rest of the Foundation’s initiatives, the motive is non-profit. The money raised goes to bring yoga, meditation, and stress reduction to university campuses and young professionals in need through the YES plus workshop. The So What! project is the creator band of the Yoga Rave. 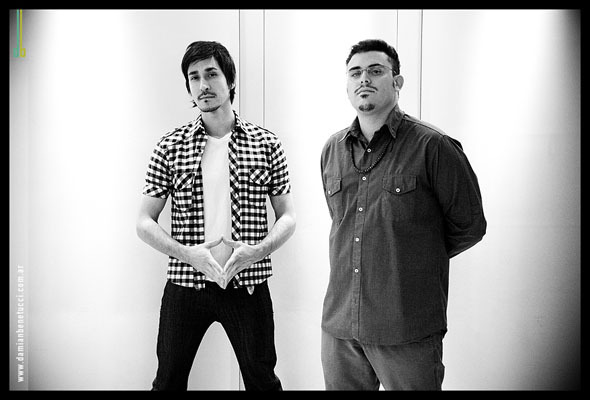 Nicolas Pucci and Rodrigo Bustos are the artistic producers and sound designers for the So What! Project and Yoga Rave parties. They are from Argentina and are volunteers of the Art of Living Foundation. They have released two albums – Smile and Blossom. They play the songs from their albums live in their Yoga Rave parties. Yoga Rave is coming to San Francisco this October 12th! Sri Sri Ravi Shankar in the Yoga Rave party in Argentina! MEDITATION – After 4 hours of dancing, you slip into deep states of meditation to end the night! Oh yeah, you will have the trampoline, glow sticks, face artists and other crazy stuff too! Here is the invitation to the Yoga Rave party in San Francisco from the Art of Living Foundation! Can’t wait for them to be in the Bay Area..Meeting few of the Argentinians last year in Montreal was exciting. I got to hear their stories how people got away from alcohol , drugs through the art of living programs. As music is very close to them, Yoga Rave was a creative idea..Perfect !! Party with a difference !! Party in Celebration of joy and transformation.